Raif bin Muhammad Badawi (Arabic: رائف بن محمد بدوي‎, also transcribed Raef bin Mohammed Badawi; born 13 January 1984) is a Saudi writer, dissident and activist, as well as the creator of the website Free Saudi Liberals. Badawi was arrested in 2012 on a charge of "insulting Islam through electronic channels" and brought to court on several charges, including apostasy. In 2013 he was convicted on several charges and sentenced to seven years in prison and 600 lashes. In 2014 his sentence was increased to 10 years in prison, 1000 lashes, and a fine. The flogging was to be carried out over 20 weeks. The first 50 lashes were administered on 9 January 2015. The second flogging has been postponed more than twelve times. The reason for the most recent postponement is unknown, but the previous scheduled floggings were delayed due to Badawi's poor health. Badawi is known to have hypertension, and his health has worsened since the flogging began. His wife, Ensaf Haidar, who took refuge in Canada after her life was threatened in Saudi Arabia, has said Badawi will not be able to survive further flogging. Ensaf Haidar has given a series of televised interviews about Badawi’s plight, including at the 2016 Geneva Summit for Human Rights and Democracy. The Raoul Wallenberg Centre for Human Rights acts as Badawi's international legal counsel. The organization has led both public advocacy campaigns as well as private diplomatic efforts to help secure Badawi's release from prison. While his exact location is unknown, it has been reported that Badawi is currently imprisoned in Dhahban Central Prison. Raif Badawi was born on January 13, 1984 in Khobar, Saudi Arabia to Najwa, a Lebanese Christian; and Muhammad Badawi, a Saudi Muslim. His Saudi grandmother explained to him at a young age that Saudi society historically wasn't as strict and men and women used to work together in the fields. Badawi's mother died young at an unknown age. He was presumed to be raised in low income by his father and grandmother. Badawi attended school until the age of thirteen when his father reported him for parental disobedience, a crime in Saudi Arabia, and spent six months in a teenage detention center with bullying, Wahhabi indoctrination, and flogging, causing him to be scarred deeply. Badawi started an online forum known as "Saudi Liberal Network" on August 13, 2006 under much influence from various sources. He was influenced by numerous books by Arab authors that refused to see the world on a purely religious standpoint, including The Universe Judges God by Abdullah al-Qasemi, Arab Culture in the Age of Globalization by Turki al-Hamad, and Prisoner 32 by Mohammed Saeed Tayeb, an author that Raif deeply admires and was placed under his wing. Additionally he was influenced by Diwaniya, a traditional evening meeting of journalists, poets, thinkers, philosophers, and authors; and all discussing a dream of a more open, tolerant, secular, and liberal society in Saudi Arabia. Raif frequented these meetings and expressed concern in these meetings about the development of civil society and declined oppression in the name of religion. He wanted to teach Saudi citizens their rights and responsibilities and have people demand their rights. Badawi's blog made headlines soon after it went online, as it was a space where Saudis can openly speak about liberalism in a conservative country known as the custodian of Mecca and Medina, the two holiest sites of Islam. He said in Arabic, "To me, liberalism means simply to live and let live." Very few Saudis dared to publicly speak about liberalism, because it constitutes apostasy, a crime punishable by death; by which Raif believed that freedom was worth the road of such sacrifice. Badawi never directly criticized the Mutawwa (religious police), whom he was protesting against; or the Saudi Government as he admired and was patriotic to the King of Saudi Arabia. Badawi primarily challenged the established rules in his posts and in example of such, he pondered on why women needed a male guardian to walk down the street and why it was extremely difficult for women to access the labor market and employment. Badawi additionally asked on his blog regarding the logic on why all Saudis need to believe in Islam, and despite his Muslim faith, he stated that Islam cannot explain everything and people should be free to believe in whatever religion they choose to follow. He explained to others in a Diwaniya meeting that they are human beings and that they have the right to express themselves and think what they want to. By the end of 2007, Badawi's blog had at least 2,000 members that debated on the methods of governing Saudi Arabia. Badawi's writings were much tolerated by the liberal King Abdullah but angered the religious police, that arrested him in late 2007. For many hours Badawi was interrogated regarding his activities and was eventually released with no charges pressed against him. Unsatisfied from the interrogation, the religious police arrived uninvited at Badawi's doorstep a few days later to search for forbidden books, but left with nothing. The religious police began to interrogate Badawi frequently, putting his wife in fear and Badawi frequently assured her that everything will be okay, under the impression that the interrogations were a piece of cake and something common in his own backyard, and the police having nothing on Badawi. Badawi's own father, Muhammad Badawi, was encouraged by religious extremists to post a series of YouTube videos denouncing his actions. First detained on apostasy charges in 2008, Badawi was released after a day of questioning. He was prevented from leaving Saudi Arabia, and both his and his wife's bank accounts were frozen in 2009. The family of Badawi's wife subsequently filed a court action to forcibly divorce the couple on grounds of Badawi's alleged apostasy. On 17 June 2012, he was arrested on a charge of “insulting Islam through electronic channels”, and the following December he was also cited for apostasy, a conviction which carries an automatic death sentence. However, Badawi was confirmed to be a Muslim after reciting the Shahada in court, and also stated that people should have the right to choose their faith. Human Rights Watch stated that Badawi's website had hosted material criticizing "senior religious figures". Badawi had also suggested that Imam Muhammad ibn Saud Islamic University had become "a den for terrorists." Following the 2012 arrest, Amnesty International designated Badawi a prisoner of conscience, "detained solely for peacefully exercising his right to freedom of expression", and said: "Even in Saudi Arabia where state repression is rife, it is beyond the pale to seek the death penalty for an activist whose only 'crime' was to enable social debate online". Calling for the government to drop the charges, Human Rights Watch stated: "The charges against him, based solely to Badawi's involvement in setting up a website for peaceful discussion about religion and religious figures, violate his right to freedom of expression". Charged with "setting up a website that undermines general security", "ridiculing Islamic religious figures", and "going beyond the realm of obedience”, Badawi appeared before a district court in Jeddah on 17 December 2012. The judge referred the charge of apostasy to a higher court, saying he "could not give a verdict in a case of apostasy." On 22 December, the General Court in Jeddah decided to proceed with the apostasy case. The higher court refused to hear the case and referred it to the lower court. On 30 July 2013, Saudi media reported that Badawi had been sentenced to seven years in prison and 600 lashes for founding an Internet forum that "violates Islamic values and propagates liberal thought". The court also ordered the website closed. On 26 December 2013, Badawi's wife Ensaf Haidar told CNN a judge had ruled that her husband should go before a high court for the apostasy charge which would result in a death penalty if convicted. On 7 May 2014 Badawi’s sentence was increased to 1000 lashes,10 years in prison, and a fine of 1 million riyal (equal to about $267,000), for “insulting Islam”. In mid-January 2015, the case was passed to the Saudi Supreme Court for review. On 1 March 2015, Badawi's wife told reporters that judges in Saudi Arabia's criminal court wanted to retry him for apostasy, and that if found guilty he would be sentenced to death. A few days after a court hearing, Badawi's wife Ensaf Haidar started receiving anonymous death threats. She fled to Sherbrooke in Québec, Canada, with their three children. On 27 January 2015, Canadian politician Marc Garneau announced in an opinion piece that he and his political colleague Irwin Cotler would "[assist] Badawi's wife in her efforts to save her husband." Addressing the UN Human Rights Council as a representative of the International Humanist and Ethical Union (IHEU), Kacem El Ghazzali criticized Saudi Arabia for sentencing Badawi to 7 years in prison and 600 lashes, calling it a "gratuitous, violent sentence". Badawi's lawyer Waleed Abulkhair (also transcribed as Abu al-Khair) was imprisoned after setting up Monitor of Human Rights in Saudi Arabia, a Saudi human rights organization. He is charged with "setting up an unlicensed organization" and "breaking allegiance with the ruler". His requests to license the organization were denied. On 7 July 2014, Abulkhair was sentenced to 15 years imprisonment, followed by a 15-year travel ban. The Specialized Criminal Court in Jeddah found him guilty of "undermining the regime and officials", "inciting public opinion", and "insulting the judiciary”. Abulkhair told BBC that Badawi had confirmed in court that he was a Muslim and had told the judge, "Everyone has a choice to believe or not believe." On 9 January 2015, Badawi received 50 lashes before hundreds of spectators in front of a Jeddah mosque, the first in a total of 1,000 lashes to be administered over twenty weeks. The incident was condemned by Amnesty International's Deputy Director for the Middle East and North Africa, Said Boumedouha: "The flogging of Raif Badawi is a vicious act of cruelty which is prohibited under international law. By ignoring international calls to cancel the flogging, Saudi Arabia’s authorities have demonstrated an abhorrent disregard for the most basic human rights principles." Prince Zeid bin Ra'ad of Jordan said: “Such punishment is prohibited under international human rights law, in particular the convention against torture, which Saudi Arabia has ratified. I appeal to the king of Saudi Arabia to exercise his power to halt the public flogging by pardoning Mr Badawi, and to urgently review this type of extraordinarily harsh penalty.” Sebastian Usher, Middle East analyst for the BBC said he suspected that Saudi leaders had been unprepared for the scale of international protest in response to the flogging. Raif Badawi’s wife Ensaf Haidar said after hearing about the flogging: “What I felt was indescribable. It was an indescribable mixture of sadness and pain... It was painfully horrible to imagine what was happening to Raif." She also said, “I appreciate all the attention that Raif’s case has been getting. I hope that all the governments in the world will intensify their efforts to pressure the authorities to stop what they intend doing [sic] to my husband. I believe they can do it, if they speak directly to the government in Saudi.” Further lashings were postponed because the injuries from the first had not healed and Badawi was in poor medical condition. Badawi is a diabetic with a slim build. He was to receive the punishment 50 lashes at a time every Friday for 20 weeks until the sentence was complete. There was an international campaign to free Badawi, comprising street protests, petitions, letters, and social media activity. The hashtag "JeSuisRaif", echoing Je suis Charlie, trended in January 2015. The readiness of some Saudi doctors to perform medical assessments prior to floggings has been questioned, and described as doctors participating in acts of torture. UK Foreign Secretary Philip Hammond raised the issue with the Saudi ambassador for the United Kingdom, and a Foreign Office spokesperson said: "We are seriously concerned by Raif Badawi’s case. The UK condemns the use of cruel, inhuman or degrading punishment in all circumstances." Eighteen Nobel laureates signed an open letter urging Saudi academics to condemn the flogging of Badawi. The Independent commented that many leading western scientists, uneasy about working with Saudi academics because of the “inexcusable” human rights situation there, may refuse to work with Saudis if the open letter is disregarded. As of 22 January 2015, Amnesty International's petition to release Badawi from prison had nearly 800,000 signatories. Badawi was again a trending topic on Twitter a week later and his wife told the BBC that the family suffered "perpetual anxiety". Urging Canadian Prime Minister Stephen Harper to intervene with Saudi authorities, she also told an all-party group of Canadian Members of Parliament that "Raif's health condition is getting worse and worse” according to several doctors who had examined her husband in the previous week, and that she was “very concerned about him. It is impossible for a human being to be able to withstand 50 lashes weekly." After the second series of lashes was postponed for the third time on 30 January 2015, with no reason given, there was hope that Badawi might be released. On 5 February 2015, it was reported that he had appeared in court the day before the next scheduled flogging. Amnesty and others again expressed concern. In Québec, where Badawi's family now live as refugees, and where his situation is seen as symbolic of the worldwide struggle for free speech, the public have taken up his case and protests in Sherbrooke and elsewhere are regular. The flogging was postponed a fourth time, with the postponement announced close to the scheduled time, keeping Badawi and those concerned about him in suspense. The following week, the National Assembly of Québec unanimously passed a motion condemning Badawi's flogging and calling on the governments of Québec and Canada to do everything possible to secure his freedom. By the end of February, the next flogging had been postponed seven times. Sixty-seven members of the United States Congress sent a bipartisan letter to the King of Saudi Arabia on 3 March 2015, calling for the release of all prisoners of conscience, including Raif Badawi and Waleed Abu Al-Khair. The same day, South Africa’s Archbishop Desmond Tutu sent a letter to King Salman in support of Badawi, saying "We are all members of faiths that underscore mercy and forgiveness." On 6 March, a group of Northern Ireland trade union leaders including journalists Eamonn McCann and Felicity McCall published an open letter in the Belfast Telegraph condemning the "barbaric punishment" of Raif Badawi and calling for his release, and German journalist Constantin Schreiber announced that Badawi's first book would be published in April. In early March 2015, Ensaf Haidar petitioned Sigmar Gabriel, Germany’s Minister of Economic Affairs, to use his influence to free Badawi during an upcoming visit to Saudi Arabia. Katrin Göring-Eckardt, a German parliamentary leader, also called on Gabriel to bring up the case during his visit. As Gabriel left for Saudi Arabia on 7 March, protesters at the airport urged him to support Badawi. Gabriel said he intended to broach the subject of Badawi with the royal family. In Riyadh he told reporters, "I think it's quite normal that people the world over are interested in something like this. And that shouldn't surprise anyone here." He added, “The harshness of this sentence, especially the corporal punishment, is something unimaginable for us, and of course it weighs on our relations (with Saudi Arabia)." The Saudi Arabian government responded by rejecting criticism of its human rights record and asserting that "it does not accept interference in any form in its internal affairs." Sweden's foreign minister, Margot Wallström, has spoken publicly about Badawi's case and other Saudi Arabian human rights issues. In March 2015, Saudi Arabia blocked Wallström's speech at an Arab League meeting in Cairo to which she had been invited as an honorary guest. Sweden then cancelled its longstanding arms agreement with Saudi Arabia. German news magazine Der Spiegel reported in March that Badawi had written from prison that he "miraculously survived 50 lashes [...] [while he was] surrounded by a cheering crowd who cried incessantly 'Allahu Akbar' ('God is greatest')". Protests and vigils outside Saudi embassies continued. On 6 August 2018, Saudi Arabia expelled the Canadian ambassador Dennis Horak, and froze all trade with Ottawa. This came after the Canada's Minister of Foreign Affairs Chrystia Freeland, expressed concern over the arrest of Samar Badawi, a human rights activist in Saudi Arabia and sister of Raif Badawi, and demanded the release of both Samar and Raif. Jimmy Wales calls for Badawi's freedom on 17 June 2015 "Day of Action for Raif". The Saudi Supreme Court upheld the sentence and there were fears Badawi could be flogged again after Friday prayers on 12 June 2015. The punishment was delayed again, hours before it was due to be inflicted. Badawi's wife believes he is in poor physical and psychological health, and fears his sentence may be "a slow death". The Independent reported in October 2016 that sources close to Badawi's family feared flogging could restart imminently, at any time during the year. Governments with ties to Saudi Arabia were urged to make representations on Badawi's behalf. Ensaf Haidar, Badawi's wife said, "I was totally shocked by the news. I'm worried and scared that they'll carrying [sic] on whipping him. (...) I'm concerned about Raif's health, which is not good - either mentally or physically. I really hope that Saudi Arabia will not go ahead and implement the sentence. I would hope that the Saudi authorities strip Raif of his citizenship and then deport him to Canada to be with us." Badawi has reportedly been on sustained hunger strike at least twice. Then Canadian Foreign Affairs Minister Stephane Dion said "We are trying to have the most accurate information possible, because if this information is true, it would be shameful. Canada completely condemns this type of lashing." Raif Badawi met his wife, Ensaf Haidar accidentally when Badawi misdialed Haidar. Haidar called back, under the presumption that it was a call from a job agency offering her a teaching position at a Madrasa. Badawi called back Haidar repeatedly to her anger because of her "lovely voice", and Haidar repeatedly declines the call out of fear for family honor. Haidar eventually began to talk to Badawi in secret, prompting one of Haidar's brothers to steal her cell phone and Badawi to travel to Jizan, Haidar's hometown, and give her another cellphone in secret and a rose. Raif Badawi married Ensaf Haidar in 2002 in Saudi Arabia, with Haidar giving birth in 2003 at the Jeddah Public Hospital to their first child, Najwa bint Raif Badawi, in his absence. In the following year, Haidar gives birth to their son, Doudi "Tirad" bin Raif Badawi, in 2004 in Badawi's presence; as well as the birth of their second daughter, Miriyam bint Raif Badawi in 2007. Badawi and Haidar lived in Jizan with their children until Haidar's brothers began to harass her and demand her to divorce from Badawi, prompting their move to Jeddah, a more liberal city. He was the founder and head of a women's education system until he sold it following his dissidence. At his wife's outrage, Badawi had an affair when he decided to spend most of his time away from home and at the school he worked at, and upon confrontation by his wife, Badawi made it a point to spend less time away from home and his children and became a liberal Muslim, devoted to his wife and children. Badawi's wife and children were granted political asylum by the Government of Canada in 2013, where they now reside. Badawi is Muslim and has made Umrah with his three children. His wife denied allegations of apostasy and said in a NPR interview that he is a "good Muslim" and promoted a "live and let live philosophy". International Laïcité Award 2018, by Comité Laïcité République shared with Ensaf Haidar. Liberty Victoria "Empty Chair" award 2016. Université de Sherbrooke university honored him by giving the master's program in law and int'l politics 2017-18 "DIPIA" his name. ^ a b c PEN International/IFEX (11 January 2013). "Prominent Saudi writer's safety at risk after arrest". The Arabic Network for Human Rights Information. Archived from the original on 16 January 2013. Retrieved 20 January 2013. ^ a b c d "Saudi Arabia: Website Editor Facing Death Penalty". Human Rights Watch. 22 December 2012. ^ a b "Saudi blogger receives first 50 lashes of sentence for 'insulting Islam'". Guardian. Associated Press in Dubai. 10 January 2015. Archived from the original on 10 January 2015. Retrieved 11 January 2014. ^ "Saudi blogger Raif Badawi spared flogging again this week". The Globe and Mail. 13 February 2015. Archived from the original on 19 February 2015. Retrieved 14 February 2015. ^ Ljundggren, David (2 February 2015). "Wife of flogged Saudi blogger Raif Badawi says his health is worsening". Reuters. Archived from the original on 24 March 2016. Retrieved 3 February 2015. ^ Garrisi, Diana (3 February 2015). "What actually happens when you get flogged". New Statesman. Archived from the original on 3 February 2015. Retrieved 3 February 2015. ^ "Tom Gross interviews Raif Badawi's wife Ensaf Haidar at the Geneva Summit 2016". 26 February 2016. Archived from the original on 4 November 2017. Retrieved 12 August 2017. ^ "How Crown Prince Mohamed bin Salman Can Prove He Is Sincere About His Reforms". Time. Archived from the original on 12 June 2018. Retrieved 15 January 2019. ^ Aldrich, Mark (18 April 2016). "Inside Raif Badawi's Prison Cell". Goshen, US. : The Gad About Town. Archived from the original on 22 November 2018. Retrieved 21 November 2018. ^ "Saudi Arabia: Travel ban against blogger Mr Raif Badawi for criticising religious police". Front Line Defenders. 8 December 2009. Archived from the original on 2 January 2013. Retrieved 2 January 2013. ^ Angus McDowall (22 December 2012). "Saudi website editor could face death for apostasy-rights group". Reuters. Archived from the original on 2 January 2013. Retrieved 2 January 2013. 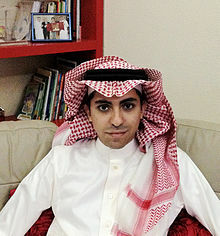 ^ a b "Saudi Arabian Blogger Could Face Death Penalty". Sky News. 23 December 2012. Archived from the original on 2 January 2013. Retrieved 2 January 2013. ^ Brian Whitaker (26 December 2013). "Saudi activist faces new execution threat". al-bab.com. Archived from the original on 30 December 2014. Retrieved 17 July 2014. ^ "Saudi Arabia uses capital offence of 'apostasy' to stifle debate". Amnesty International. 24 December 2012. Archived from the original on 2 January 2013. Retrieved 2 January 2013. ^ "Saudi rights activist faces apostasy charge". Middle East Online. 17 December 2012. Archived from the original on 30 December 2012. Retrieved 20 January 2013. ^ "BBC News - Raif Badawi: Court refuses to charge Saudi blogger". BBC News. Archived from the original on 2 July 2014. Retrieved 11 January 2015. ^ "Saudi Arabian social website editor sentenced to seven years behind bars and 600 lashes". NY Daily News. Archived from the original on 12 June 2015. Retrieved 11 January 2015. ^ Salma Abdelaziz, CNN (26 December 2013). "Wife: Saudi blogger recommended for apostasy trial - CNN.com". CNN. Archived from the original on 16 January 2015. Retrieved 11 January 2015. ^ Jamjoom, Mohammed (7 May 2014). "Saudi activist sentenced to 10 years, 1,000 lashes for insulting Islam". CNN International. Archived from the original on 8 May 2014. Retrieved 8 May 2014. ^ "Saudi blogger Raif Badawi gets 10 year jail sentence". 8 May 2014. Archived from the original on 8 May 2014. Retrieved 11 January 2014. ^ "Saudis 'to review' flogging of blogger Raif Badawi". BBC. 16 January 2015. Archived from the original on 23 January 2019. Retrieved 21 July 2018. ^ "Saudi Arabia publicly beheads woman in holy Mecca as blogger lashings are postponed". The Independent. 16 January 2015. Archived from the original on 18 October 2017. Retrieved 10 September 2017. ^ "Postponement of Raif Badawi flogging on medical grounds exposes shocking brutality of punishment". Amnesty International. 16 January 2015. Archived from the original on 17 February 2015. ^ Rawlinson, Kevin (1 March 2015). "Saudi blogger Raif Badawi could be retried and beheaded, say his family". The Guardian. Archived from the original on 20 October 2017. Retrieved 12 December 2016. ^ Green, Chris (1 March 2015). "Raif Badawi, the Saudi Arabian blogger sentenced to 1,000 lashes, may now face the death penalty". The Independent. Archived from the original on 15 July 2017. Retrieved 10 September 2017. ^ Nianias, Helen (15 January 2015). "Raif Badawi: Sentenced to 1000 lashes, the man who started Free Saudi Liberals website has ignited a global debate". The Independent. Archived from the original on 25 September 2015. Retrieved 10 September 2017. ^ "Opinion: Canada must use all diplomatic resources to help free Raif Badawi". Montreal Gazette. 27 January 2015. Archived from the original on 27 January 2019. Retrieved 27 January 2019. ^ "International Humanist and Ethical Union - IHEU laments Human Rights Council member states who imprison "blasphemers"". Archived from the original on 9 December 2016. Retrieved 11 January 2015. ^ "IHEU representative Kacem El Ghazzali in support of Raif Badawi at the United Nations". YouTube. Archived from the original on 1 December 2015. Retrieved 11 January 2015. ^ "Waleed Abu al-Khair: Rights Defender On Trial". Human Rights Watch. Archived from the original on 4 May 2014. Retrieved 8 May 2014. ^ Smith, Lydia (7 July 2014). "Waleed Abulkhair Given 15 Years for Activism: Who is the Influential Saudi Human Rights Lawyer?". International Business Times. Archived from the original on 2 February 2015. Retrieved 16 January 2015. ^ "Jailed and on trial for reporting human rights violations". Reporters Without Borders. 20 June 2014. Archived from the original on 21 March 2015. Retrieved 6 March 2015. ^ "Lash and jail for Saudi web activist Raef Badawi". BBC. 30 July 2013. Archived from the original on 11 July 2014. Retrieved 17 July 2014. Lawyer Waleed Abu Alkhair told the BBC that Mr Badawi, a father of three, had confirmed in court that he was a Muslim but told the judge "everyone has a choice to believe or not believe." ^ "Flogging of Raif Badawi in Saudi Arabia 'vicious act of cruelty'". Amnesty International. 9 January 2015. Archived from the original on 15 January 2015. Retrieved 12 January 2015. ^ "Saudi blogger Raif Badawi's case referred to supreme court, says his wife". The Guardian. 16 January 2015. Archived from the original on 6 July 2015. Retrieved 12 December 2016. ^ "Saudi Arabia postpones flogging of Raif Badawi again". BBC. 22 January 2015. Archived from the original on 17 August 2018. Retrieved 21 July 2018. ^ "Pressure grows on Saudi Arabia over blogger facing second flogging". The Guardian. 15 January 2015. Archived from the original on 13 August 2016. Retrieved 12 December 2016. ^ McVeigh, Tracy; Mahmood, Mona (17 January 2015). "Saudi blogger's wife says global pressure could force his release". The Guardian. Archived from the original on 11 November 2016. Retrieved 12 December 2016. ^ a b c Black, Ian (23 January 2015). "Planned flogging of Saudi blogger Raif Badawi postponed again". The Guardian. Archived from the original on 23 December 2016. Retrieved 12 December 2016. ^ "Close friend of Raif Badawi says he's 'not in a good condition'". BBC Radio 5. 18 January 2015. Archived from the original on 25 January 2015. Retrieved 20 January 2015. ^ Paquin, Mali Ilse (21 January 2015). "Saudi blogger's wife: I feel destroyed but I will not sit in a corner and cry". The Guardian. Archived from the original on 18 December 2016. Retrieved 12 December 2016. ^ a b "Raif Badawi's flogging is halted, but the protest goes on. Demonstrators outside the Saudi embassy remind Zoe Williams that this outrage is all our business". The Guardian. 23 January 2015. Archived from the original on 18 August 2016. Retrieved 12 December 2016. ^ a b Kestler-D'Amours, Jillian (4 March 2015). "Bianca Jagger joins fight to free Saudi blogger Raif Badawi: A global campaign to free Raif Badawi is growing amid concerns the father of three now risks beheading on charges of apostasy". thestar.com. Archived from the original on 8 August 2016. Retrieved 10 September 2017. ^ "FreeSpeechStories: The explosion of #JeSuis____ campaigns". BBC. 20 January 2015. Archived from the original on 1 July 2018. Retrieved 21 July 2018. ^ "Raif Badawi: Flogging case raised with Saudi ambassador". The Independent. 22 January 2015. Archived from the original on 3 August 2016. Retrieved 10 September 2017. ^ "Raif Badawi Exclusive: Nobel Laureates urge Saudi academics to condemn flogging of writer jailed for daring to criticise clerics". The Independent. 19 January 2015. Archived from the original on 25 September 2015. Retrieved 10 September 2017. ^ Ries, Brian (22 January 2015). "Flogging of Saudi blogger is postponed again as doctors raise health concerns". Mashable. Archived from the original on 13 September 2015. Retrieved 1 November 2015. ^ "Beaten for blogging: #Free Speech Stories". BBC. 16 January 2015. Archived from the original on 21 September 2016. Retrieved 21 July 2018. ^ "Raif Badawi's wife seeks Stephen Harper's help for jailed Saudi blogger". Canadian Broadcasting Corporation. 29 January 2015. Archived from the original on 31 January 2015. Retrieved 30 January 2015. ^ Banerjee, Sidhartha (30 January 2015). "Does release of Souad al-Shammari mean Raif Badawi could be freed?". Global News. Archived from the original on 2 April 2015. Retrieved 31 January 2015. ^ "Raif Badawi back in court, future remains uncertain". CBC News. 5 February 2015. Archived from the original on 8 February 2015. Retrieved 6 February 2015. ^ Lalonde, Michelle (4 February 2015). "Campaign to release Saudi blogger heats up as case referred to Court of Appeal". Montreal Gazette. Archived from the original on 24 January 2019. Retrieved 27 January 2019. ^ "Saudi blogger Raif Badawi's flogging delayed for 4th week". CBC News. 6 February 2015. Archived from the original on 7 February 2015. Retrieved 7 February 2015. ^ "Raif Badawi: National Assembly lends support to Saudi blogger". CBC News. 11 February 2015. Archived from the original on 25 February 2015. Retrieved 6 March 2015. ^ "Raif Badawi weekly flogging delayed for 7th week in a row". CBC News. 27 February 2015. Archived from the original on 28 February 2015. Retrieved 28 February 2015. ^ Brekke, Kira (5 March 2015). "Members Of Congress Call On Saudi Arabia To Release Blogger Raif Badawi". The World Post. Archived from the original on 6 March 2015. Retrieved 6 March 2015. ^ "Letter from U. S. Congress to King Salman bin Abdul-Aziz Al Saud" (PDF). Amnesty International. 3 March 2015. Archived (PDF) from the original on 6 March 2015. Retrieved 6 March 2015. ^ a b Benson, Ophelia (3 March 2015). "Desmond to Salman". Butterflies and Wheels. Archived from the original on 9 March 2015. Retrieved 7 March 2015. ^ "Appeal to free flogged blogger from Saudi jail". Belfast Telegraph. 6 March 2015. Archived from the original on 2 April 2015. Retrieved 6 March 2015. ^ Schreiber, Constantin (6 March 2015). "Proud to support @raif_badawi with our new book, out 1 April". Twitter. ^ "New arms export revelations embarrass Gabriel ahead of Mid-East tour". Deutsche Welle. 6 March 2015. Archived from the original on 7 March 2015. Retrieved 6 March 2015. ^ "Blogger Badawi: Gabriel wants to work for release". Panteres. 7 March 2015. Archived from the original on 23 March 2015. Retrieved 7 March 2015. ^ "Blogger Badawi a hot topic on Gabriel's Riyadh visit". Deutsche Welle. 7 March 2015. Archived from the original on 9 March 2015. Retrieved 8 March 2015. ^ "Merkel's deputy says case of blogger Raif Badawi straining Saudi-German relations". StarTribune. Associated Press. 8 March 2015. ^ McDowall, Angus; Jones, Gareth (7 March 2015). "Saudi Arabia rejects rights criticism after flogging of blogger". Reuters. Riyadh. Archived from the original on 21 November 2015. Retrieved 21 November 2015. ^ "Saudi Arabia accused of blocking criticism of human rights record". The Guardian. 9 March 2015. Archived from the original on 22 July 2016. Retrieved 12 December 2016. ^ Crouch, David (10 March 2015). "Saudi Arabia recalls ambassador to Sweden as diplomatic row deepens". The Guardian. Archived from the original on 25 February 2017. Retrieved 12 December 2016. ^ "Saudi-arabischer Blogger Badawi: "Auf wundersame Weise 50 Peitschenhiebe überlebt"". Der Spiegel (in German). 27 March 2015. Archived from the original on 14 June 2015. Retrieved 15 June 2015. ^ Burke, Jason (11 June 2015). "Saudi blogger Raif Badawi may receive second set of lashes on Friday". Archived from the original on 6 December 2016. Retrieved 12 December 2016 – via www.theguardian.com. ^ "Raif Badawi, Saudi Arabian Blogger, May Receive Death Sentence Instead Of 1,000 Lashes". Inquisitr. 1 March 2015. Archived from the original on 2 March 2015. Retrieved 6 March 2015. The news is renewing international outcry, with protests and official condemnations of Raif Badawi’s punishments, as well as social media campaigns. ^ "276 candidates for Nobel Peace Prize". News in English.no. 3 March 2015. Archived from the original on 2 April 2015. Retrieved 6 March 2015. Badawi’s punishment has sparked outrage around the world, including ongoing protests outside the Saudi Arabian embassy in Oslo. ^ "Raif Badawi vigils". English PEN. 19 February 2015. Archived from the original on 28 February 2015. Retrieved 7 March 2015. ^ "Raif Badawi tells of flogging ordeal in letter from Saudi prison". The Guardian. Agence France-Presse. 27 March 2015. Archived from the original on 28 March 2015. Retrieved 27 March 2015. Photo: Protesters outside the Saudi Arabia embassy in London. ^ "Campaign Events". RaifBadawi.org. 10 March 2015. Archived from the original on 21 March 2015. Retrieved 11 March 2015. ^ "Saudi Arabia expels Canadian ambassador over criticism". 6 August 2018. Archived from the original on 23 January 2019. Retrieved 7 August 2018. ^ "Quebec opens its doors to imprisoned Saudi blogger Raif Badawi". Archived from the original on 13 June 2015. Retrieved 12 June 2015. ^ "Saudi blogger's 'slow death sentence'". 12 June 2015. Archived from the original on 23 January 2019. Retrieved 21 July 2018 – via www.bbc.co.uk. ^ (www.dw.com), Deutsche Welle. "Saudi blogger Raif Badawi to be given more lashes in prison - News - DW - 18.10.2016". DW.COM. Archived from the original on 21 October 2016. Retrieved 20 October 2016. ^ "Raif Badawi : Dreaming of freedom. A documentary graphic novel". ici.radio-canada.ca (in French). Archived from the original on 16 November 2018. Retrieved 15 November 2018. ^ "Jailed, Whipped Saudi Blogger Wins 2015 Sakharov Prize". Radio Free Europe/Radio Liberty. 29 October 2015. Archived from the original on 1 November 2015. Retrieved 1 November 2015. ^ "About Raif Badawi". RaifBadawi.org. 2015. Archived from the original on 24 March 2015. Retrieved 14 March 2015. ^ "Scholars Argue Prosecutions Against Muslim Liberals Don't Follow Islamic Teachings". NPR.org. Archived from the original on 24 August 2018. Retrieved 23 August 2018. ^ "Remise des Prix de la Laïcité le 6 novembre 2018". laicite. 6 November 2018. Archived from the original on 16 November 2018. Retrieved 16 November 2018. ^ "Raif Badawi is the 2018 LA Press Club Daniel Pearl Awardee". LA Press Club. 26 March 2018. Archived from the original on 3 August 2018. Retrieved 3 August 2018. ^ "2018 Freedom Award". Twitter. 26 April 2018. ^ "AN EMPTY CHAIR TO HONOUR LASHED SAUDI BLOGGER". libertyvictoria. 23 July 2016. Archived from the original on 3 August 2018. Retrieved 3 August 2018. ^ "Raif Badawi and Ensaf Haidar receive the Deschner Prize | Gbs". giordano-bruno-stiftung.de. 14 March 2016. Archived from the original on 3 August 2018. Retrieved 27 March 2018. ^ "Awards & Prizes". Raif Badawi Foundation. 26 April 2018. Archived from the original on 3 August 2018. Retrieved 3 August 2018. ^ "2016 Prize for Freedom". INLW. 5 December 2016. Archived from the original on 12 October 2017. Retrieved 18 July 2017. ^ "Saudi blogger Raif Badawi awarded freedom of speech prize". The Guardian. 10 April 2016. Archived from the original on 27 April 2017. Retrieved 18 July 2017. ^ "Saudi blogger Raif Badawi awarded Sakharov human rights prize". BBC News. 29 October 2015. Archived from the original on 5 August 2018. Retrieved 21 July 2018. ^ "Ensaf Haidar, Raif Badawi and Waleed Abulkhair awarded Freethinker Prize 2015". Freethinkers Association of Switzerland. 15 October 2015. Archived from the original on 4 March 2016. Retrieved 27 March 2018. ^ a b "Saudi Arabia: Call for Release of Imprisoned Human Rights Lawyer Waleed Abu al-Khair". Lawyers’ Rights Watch Canada (LRWC). 27 June 2016. Archived from the original on 28 March 2018. Retrieved 27 March 2018. ^ "Jailed Saudi Blogger Raif Badawi Co-Winner Pen Pinter Prize". The Guardian. 5 October 2015. Archived from the original on 17 October 2016. Retrieved 12 December 2016. ^ "Roland Ries prend la défense du blogueur Raif Badawi". dna.fr. 4 May 2015. Archived from the original on 14 June 2015. Retrieved 13 June 2015. ^ "the franco German Award". raifbadawi.org. 4 May 2015. Archived from the original on 4 March 2016. Retrieved 5 June 2015. ^ "Swedish Reporters Without Borders Awards Saudi Blogger Press Freedom Prize". Reportrar Utan Gränser. 3 May 2015. Archived from the original on 5 June 2015. Retrieved 27 March 2018. ^ "DW Freedom of Speech Award for Raif Badawi". DW. 25 February 2015. Archived from the original on 26 February 2015. Retrieved 26 February 2015. ^ "20 rights groups to bestow courage award upon Saudi blogger at Geneva Summit". Geneva Summit. 17 February 2015. Archived from the original on 19 February 2015. Retrieved 19 February 2015. ^ "Scottish Secular Society Presents Raif Badawi with Annual Aikenhead Award". Scottish Secular Society. 3 January 2015. Archived from the original on 7 January 2015. Retrieved 7 January 2015. ^ a b c "Jailed Saudi blogger receives PEN Canada's One Humanity Award". PenCanada. 21 October 2014. Archived from the original on 23 November 2014. Retrieved 28 November 2014. ^ "Reporters Without Borders: TV5Monde Prize for Press Freedom". Reporters without Borders. 5 November 2014. Archived from the original on 3 December 2014. Retrieved 28 November 2014. ^ "Address by Professor Pierre Cossette, Rector of the Université de Sherbrooke, on the occasion of the presentation of a doctorate of honor to Raïf Badawi". Université de Sherbrooke. 8 June 2017. Archived from the original on 3 August 2018. Retrieved 3 August 2018. ^ "Montreal grants honorary citizenship to Saudi blogger Raif Badawi". The Globe And Mail. 28 May 2018. Archived from the original on 29 May 2018. Retrieved 3 August 2018. ^ "The 2017-18 DIPIA cohort takes the name of Raif Badawi". Université de Sherbrooke. 13 September 2017. Archived from the original on 3 August 2018. Retrieved 3 August 2018. ^ "Global Thinkers". Foreign Policy. 2 December 2015. Archived from the original on 3 December 2015. Retrieved 4 December 2015. ^ "AskMen". AskMenUk. 2 December 2015. Archived from the original on 8 December 2015. Retrieved 4 December 2015. ^ "Sherbrooke, terre d'accueil pour Raif Badawi". Université de Sherbrooke. 10 July 2015. Archived from the original on 4 March 2016. Retrieved 12 July 2015. ^ "the honorary title". VUB. 3 May 2015. Archived from the original on 8 December 2015. Retrieved 3 May 2015. ^ "Man Of The Year". The Fifth Column. 1 December 2015. Archived from the original on 3 December 2015. Retrieved 4 December 2015. ^ "Saudi Blogger Raif Badawi Nominated for Nobel Peace Prize 2015". Morocco World News. 2 February 2015. Archived from the original on 22 December 2015. Retrieved 3 February 2015. ^ "Fredsprisen til Raif Badawi og Waleed al-Kahir". Archived from the original on 24 April 2016. Retrieved 14 April 2016.